After an amazingly successful Air Tattoo just 11 weeks ago that saw the Royal Air Force celebrate its 100th anniversary, the organisers of the Royal International Air Tattoo have today (27 September) confirmed that tickets for the next event are now on sale. 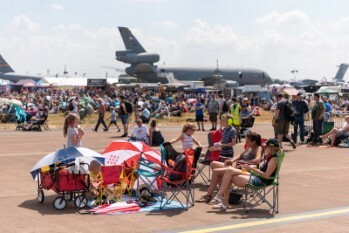 Held over Friday 19 - Sunday 21 July 2019, the airshow will revert to a two and a half day schedule last seen in 2017. Super Earlybird discounts are now on sale and, following 2018, both Super Earlybird and Earlybird will end after a set number of tickets have been sold. Friday 19 July returns to an exclusive preview day with 4 hours of flying with aircraft arrivals before and after this time, as well as the Green Zone being closed for static aircraft parking. However, new for 2019, Friday enclosure upgrades to the Viewing Village, Cotswold Club as well as the Aviation Club, First Class Lounge and Lightning Pavilion will receive a free Souvenir Programme per booking. Full changes for 2019 can be seen HERE. Saturday 20 and Sunday 21 July will be full airshow days with a 7 hour plus flying display and access to the whole showground for visitors. The free child offer extended to under-18s in 2018 has also been kept, making the Air Tattoo a great value day out for families! Tickets can be booked now at AirTattoo.com.